Recently my friend invited me to see a direct selling company plan. I had seen a few MLM companies business plans too. I found one common term that is passive income. So I thought to share the top 5 ways to create passive income 2018. Most of the people are creating wealth by using these methods. Before I start to tell about top 5 ways to create passive income, we should understand the difference between active income and passive income. You must know the famous writer Robert T Kiyosaki who is an American businessman and Author. He has written best sellers books on business education and Personal Finance. I would recommend his few books those are Rich Dad Poor Dad, Rich Dad’s Cashflow Quadrant: Guide to Financial Freedom, The Business School, Rich Dad’s Retire Young Retire Rich and many more. So by reading these books and attending the seminars, I got to know active income earned by employees and self-employed people. Why it is called active income as if an employee or self-employed don’t go for work he will not earn money. So he has to work on a regular basis so that he can earn money. Whereas in passive income people come who have created a system and that system work for them. For example franchise model or network of people or author or singer. Author-written a book and he/she will be getting the royalty for that book on every sale and singer sang a song and he/she will be getting the royalty income. A franchiser gives a franchise of his store if any store is not working and not open for a few days then also he is earning from the other stores, more or less he is earning. I hope now you must be clear about passive income and active income. If you have a big house and you rented it, you can create a passive income. Also by investing your money in secured funds, you can generate income from the interest. These incomes are an example of passive income as here you are not going to do any work. It will come on a regular basis till the house is rented or amount invested. Insurance advisors also earn passive income by selling insurance. We can’t say it’s completely passive income but till the policy running he will get the commission for the sold policy. As for rental income required money to buy a house as well for investment also required money. So if a person doesn’t have money then also he can earn passive income by doing work today and income every year till the policy runs. Affiliate marketer also makes passive income by just setting up the system of marketing the products by spreading affiliate links and creating email funnels. So that they setup promotion of affiliate products and earn income on regular basis. Multi-level marketing a great way to create passive income. You have to build your great team once and huge passive income can be earned. If you can write a book or create jingles or song you can earn royalty income. Once you published your book and created jingles or song whenever it will be bought you will be getting income. So it’s another way to create passive income. Everyone has an interest and knowledge about something he/she like on which you can create your blog or videos and you can earn money by just helping people through sharing your knowledge on your blogs or youtube. Google provides you ads on blog and youtube through their Adsense. 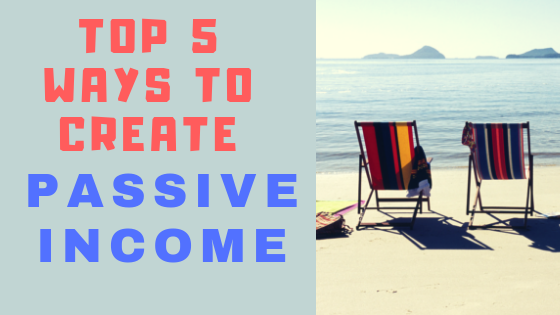 So finally you now know top 5 ways to create passive income, but here I must clarify you that creating passive income is not easy, it takes time to create it. It’s not quick money kind of thing as its take long time and efforts to build it in your part-time. In few methods may require the huge amount of investment as like renting a property or investment. But in few ways, its require only your knowledge, time and very less of money to build it. So choose your way to create passive income and work on it. For me, favorite ones and worked for me are Affiliate marketing, MLM, Blogging, Youtube and Insurance Adviser. Do comment which way is best for you. Let us know about this article Top 5 Ways to Create Passive Income 2018 and please comment your views and thoughts too. Also, do visit our youtube channel and subscribe our channel Sab Kuch Online for more informative videos.